LOT of ground to cover today folks, so let’s get right to it. Phil Reed of Battlegrip recently posted “Five Reasons Why Action Figures Cost More Today.” Phil knows what he’s talking about and you should check out the whole thing, which focuses largely on economic factors such as rising labor and materials costs. But one thing that interested me was the first comment on the post, which mentioned the declining birthrate in Western countries. That reminded me of this post by Richard Gottlieb that I read recently, “U.S. Birthrate Plummets; Look for Fewer Children in Four Years.” Richard begins the article with, “If there was ever a case to be made for marketing toys to adult end users…” Hasbro has clearly embraced this idea, but if I had to guess I’m willing to bet there’s still a struggle going on at Mattel between the generations over how to approach the collectors’ market. On a related note, Richard also posted “A Tough Year for Toys; is Wal-Mart Part of the Problem?” in which he states, “there is far more play product available than there is demand. Mobile devices and apps (many free or nearly so) have joined video games and traditional toys in the fight for people’s time and dollars. I see this as a non-cyclical issue which is going to take a long time to shake out.” (Walmart’s role is that because it’s the biggest toy retailer and is struggling, that may be part of the reason the industry itself is struggling.) Again, worth a read. And returning to Battlegrip, I wrote a lengthy comment response to Phil’s post “Five Points of Articulation is Plenty for Play.” Give the post a read and let me know what you think. I’m a big fan of Phil’s and this was the first time I’ve ever disagreed with him this strongly on something. But I’m glad he wrote it and that a (civil) discussion can be had, because it’s an interesting question and one I’d love to see examined in more detail. What do you think? Are we adult collectors too obsessed with articulation? More than a few of you emailed me about Back to the Future II screenwriter Bob Gale’s disappointment with Mattel’s hoverboard prop replica. You can read about it here. Money quote: “[…]I really don’t understand why they didn’t get in front of this issue when they made this compromise instead of choosing to disappoint their customers at delivery time. But no one likes to own mistakes or compromises, especially in corporations. ” Look, I know some people think I’m biased against Mattel, which isn’t true. 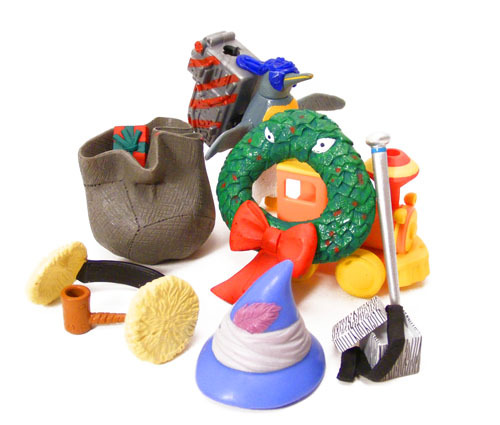 They’ve made some of my favorite toys over the years. But a pattern is a pattern. 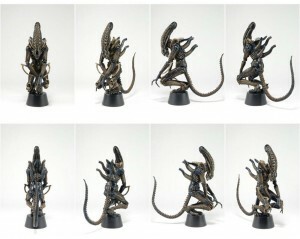 –NECA has been tweeting photos of their upcoming Aliens Hicks, Hudson and the new, even-more-articulated Warrior Alien. They look amazing. These are the toys 12-year-old Poe always wanted. You can see the other photos on their Twitter page. Just a reminder, this week’s Figure It Out ends tomorrow at 11:59pm ET. –And finally, Pacific Rim looks awesome. More than ever, I’m wondering who will get the master toy license. Someone has to, right? If I had my druthers, Tamashii Nations would get it for S.H.MonsterArts and their various robots lines. If I had to choose a U.S. company, though, it would be NECA, who have been hitting at all cylinders lately and have been hinting as to some big licenses for 2013. So, fingers crossed. remember when i said i'm planning on phasing out my action figure buying in 2013? NECA is the only company that MIGHT keep me buying… they're making it incredibly hard to resist the screaming and jumping up and down that 11 year old dayraven is doing in my head… first, they gave us world class predator figures… then, we start getting rocky… robocop hits, terminator hits, now they're posting pics of WIP dutches (dutchy? dutchae? ), hicks, hudson, and an alien, and we got a couple snaps of rambo here a few weeks back… what am i supposed to do? i am but one man, one budget… i'm going to have cough up a kidney to keep in product, but DAMN does NECA make it easy. and that's if i didn't give a crap, not one crap, about the kickass prometheus stuff, the gears line, the friggin ZOMBIES, or the random coolness from the now playing line… it hurts to love this much. and unlike mattel, i have NO problem or moral dilemma supporting NECA's business practices/ethics. i have no practical complaint to stop me from buying, other than my wife's weeping and gnashing of teeth. How can you NOT love a company that puts out Evil Dead figures knowing that they'll just barely break even on them, just because they're fans and want to get us properly articulated/sculpted Ashes? It should also be noted that Bob Gale posted some comparison pics of the Hoverboard to the props the next day and the concensus of that post seemed to be that "Mattel did okay". The Hoverboard drama is mostly just that. 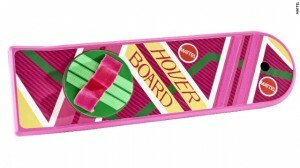 That said, the Hoverboard isn't as nice or high in quality as Mattel's two Ghostbusters props. It's an okay piece, but it doesn't make the jump from being a toy to being a prop replica the way the two previous attempts did. And yet it was marketed as a prop replica. They really should have ditched all the sound nonsense and just made a solid replica, lenticular and all. Or, if they didn't think it would cost out (and they seriously should have known it wouldn't cost out — this is what they do for a living, after all) then they should have just marketed the thing as a toy hoverboard, not a replica. This was a serious ruse, and a much bigger deal than ridiculous reversed forearms that matter diddly-squat and yet result in a free gift. Allowing customers to cancel their pre-orders on this thing and then only say no harm, no foul, is the bare minimum. But I suppose that won't matter to everyone who's getting a free MOTUC figure but complaining that it's a duplicate and not something new. I really don't care about how they marketed it. This was always going to be a Mattel's version of a prop replica and while we must be vocal in keeping Mattel on their toes, at some point we also have to take responsibility as buyers. There's a lot of heavy-handed criticism out there because people seemed to think Mattel was going to do something nicer than what they did. It would've been foolish to expect the 12" Ghostbusters to be Hot Toys quality and so I find myself having a hard time with the folks really feeling like that Mattel misrepresented what they were doing. If I recall, the Ghostbusters items were also marketed as prop replicas and there doesn't seem to be much issue with GB fans that they're just really nice toys at the end of the day. While I'm not satisfied with the Hoverboard myself, I don't think the detractors would be any happier had it at least reached the heights of the Ghostbusters roleplay items, so I question how over-the-top the criticism has become. Just as an example, I'm seeing plenty of talk about Gale's apology and not so much about his board comparisons where he walks his opinion back (and honestly the Mattel one looks nicer than the props in the photos). Honestly, having mine in hand, it looks fine, it sounds find, but it's just not fun. I'm not sure what Mattel could have done to make it more fun, but swapping out the sound for a lenticular sticker was definitely not it. I was also one of those kids that loved my super poseable Spider-Man from the Animated Series line because of his articulation. Once the Spider-Man Classics hit my mind was blown. I had no idea figures like these were possible without sacrificing a high amount of detail. Marvel Legends gets a lot of flak for too much articulation, and I can see that (I don't think the hands and toes need to be articulation, but shoulder hinges that allow them to move their shoulders forwards and backwards are very awesome). For Toybiz it was quality control that brought down a lot of their figures since the articulation was there, but they could get quite loose. I think Hasbro has it figured out based on their new base body that Bucky Cap and USAgent have, and looking forward to Hyperion/ Sentry they're on the right track. Also forgot to add that I'm very glad Hasbro and DST have started using those ankle joints that a lot of Japanese figures have. That simple point of articulation really adds to the poseability of their figures. well… my childhood favorite lines were COPS and GI JOE…. they were prob the most articulated of their time??? when i was a kid i didnt give a damn if they could stand, as long as they could beat the crap out of each other in the coolest and funnest ways. but then my next favorite was the xmen line. i guess they were 9 points because of the elbows and knees? * Durable and playable. Fewer points, with five being plenty to have fun. * Photogenic and poseable. For this I am not sure how many is plenty. It almost feels to me like once I go beyond the five basic points I start to need dramatically more points of articulation to make the toy go into crazy poses. I at least want knees, if just so the figure can sit. Thatt's what I like about the old Star Wars vehicles; the toys were designed to work perfectly within the limitations of the figures. The one time I can think of where knees would have been incredible is the Speeder Bike. "But one thing that interested me was the first comment on the post, which mentioned the declining birthrate in Western countries. " I'm glad you found my comment interesting Poe. 🙂 something I was going to mentionin my reply at BattleGrip, but didn't: Halloween's different today, compared to 20 years ago. It's possible this is still a regional observation, but a I'm convinced that the lack of trick-or-treaters was the first visile sign I'd noticed a few years back of there being less actual children running around. When I was young, the streets looked like the scene from ET. Now, there will be an isolated pocket near a school of 100 or so people, and the rest of my town is a ghost town. While the one commentor at BattleGrip who pointed to Hasbro's loss on BattleShip, and jacking prices/lowering costs to make up that failure makes sense — I'm convinced population dynamics must have some effect on how toy manufactures scale thesize, quality, and price of their wares. I can't remember where I read it, but I recently read that Candyland print runs are decided based on births: If X number of people are born in 2012 then X number of games are printed in 2015. The piece claimed that the print runs each year almost exactly match number of children born three years before the current year. If that's true it is astounding; imagine having a product where you sold one copy to everyone in the US. I suspect that isn't exactly accurate, but I wouldn't be shocked to find out that there's a formula they use to determine print runs based on number of children born. I just don't really believe it can be a one-to-one multiplier.